Memcached is a distributed memory object caching system, which stored data in memory on key-value basis. It is very useful for optimizing dynamic websites and enhanced speed by caching objects in memory. This article will help you to install Memcached with PHP Memcache extension on Debian 9 Stretch and Debian 8 Jessie systems. Update apt package cache on your system and then install Memcached on Debian system. Execute below commands from command prompt. You can find the details information about Memcache configuration here. 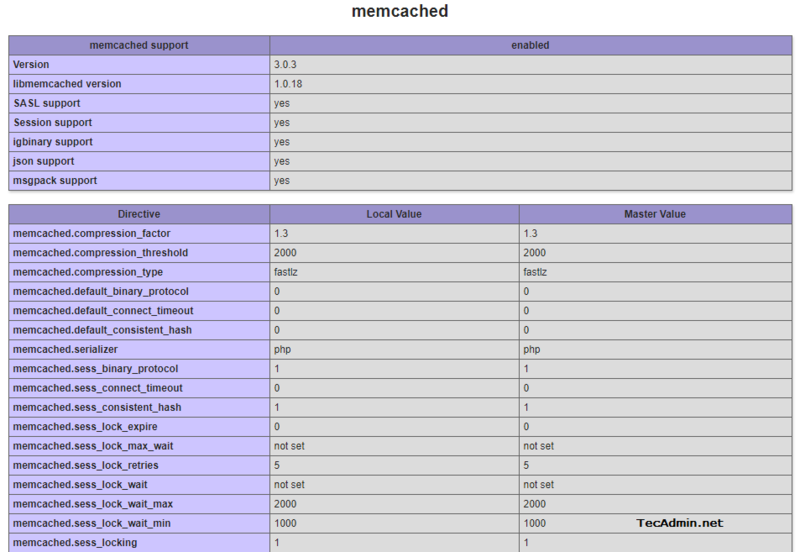 For inital level configuration check for the following settings under Memcache configuration file /etc/memcached.conf. -d => Run Memcached in deamon mode. -l => Define IP address to listen on. Use 0.0.0.0 to listen on all IPs(enterfaces). After making changes, restart the Memcached service. Use nc command to check Memcached status. This will show you the current statistics of running Memcached server. So the values may differ per installation. Execute the following command to install PHP Memcached extension on your system. After completing the installation, you must restart the Apache service to reload all settings. All done , You can now test Memcache php extension is enabled and working properly by creating a info.php file using following code. Now copy info.php file on Apache document root and access on the web interface. Search for the Memcache, You will get the result like below.